With macOS 10.12 Sierra, Apple introduced a way to offload some of your Mac’s storage dynamically using iCloud. The Documents & Desktop option had the most impact, in that it could not just sync your home folder’s Documents and Desktop folders to iCloud and make them available through iOS, iCloud.com, and other Macs, but also delete the least-used and oldest documents from your Mac if local storage was under pressure. The copy kept in iCloud would be available on demand, so accessing an infrequent document retrieves it. Macworld reader Chris is running up against this feature, because they use their Desktop for their active working documents. “Files I’m working on go there until finished, and then are moved to their various folders,” he writes. However, he often works with large Photoshop files. This leads to excessive syncing. Chris would prefer to only sync his Documents folder, and wonders if there’s a way to do so. Unfortunately, Apple pairs Documents and the Desktop together. 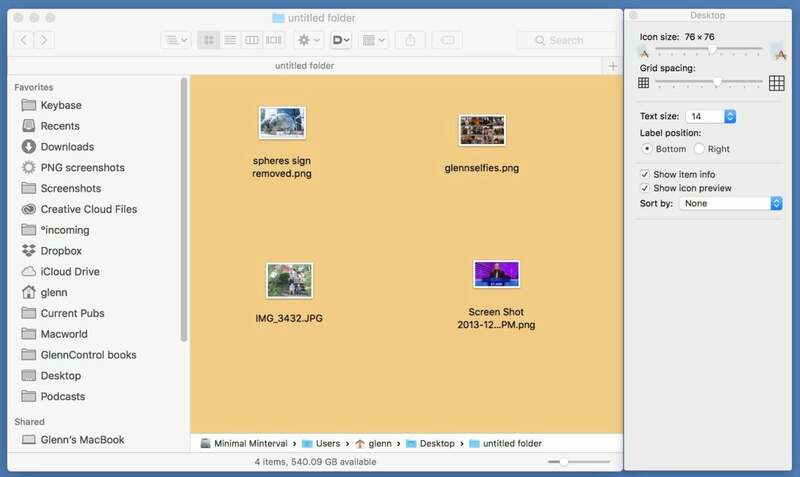 Even if you use the Finder spaces feature to create multiple desktops, macOS still stores the actual items in the same Desktop folder. You could switch to another syncing service, like Dropbox, which only syncs the Dropbox folder, and store your documents there. Create a new folder and place it anywhere. Select View > Icons for a Desktop-like icon view. Select Show > Show View Options, and set a background color or picture. Add the folder to your sidebar so it can be reached from any open or save dialog. Click the green full-screen button on the folder’s window in the Finder. Create a faux Desktop folder to avoid syncing with iCloud. This might be close enough to what you need to let you keep using Desktop & Documents for synchronization without the constant Internet file updates to iCloud.